It is March- the beginning of March. And, here in the midwest that means that we are reaching the end of a long, hard winter. It also means that I am getting antsy for warmer weather. Open windows and lots of outside play sounds like a dream right about now, but we still have at least one month of cold, gray weather ahead of us. Open the Shades + This might seem pretty obvious, but so many people keep their blinds/curtains/shades pulled during the cold months and this really cuts down on the amount of vitamin D they might get. Vitamin D is a lovely little thing. It helps our overall health, but also keeps us alert and awake! So, open those shades and let in the sun! Paint a Room + Last summer I had an antique gold bedroom. My taste in home paint colors shifted to a cooler palette and right before the baby was born my mom and Mark painted it a nice, lovely white. We were worried that it would seem like a white rental room, but it doesn't. It was the best decision. When the sun comes in, I wake so much better and the airy-ness puts a little pep in my step. 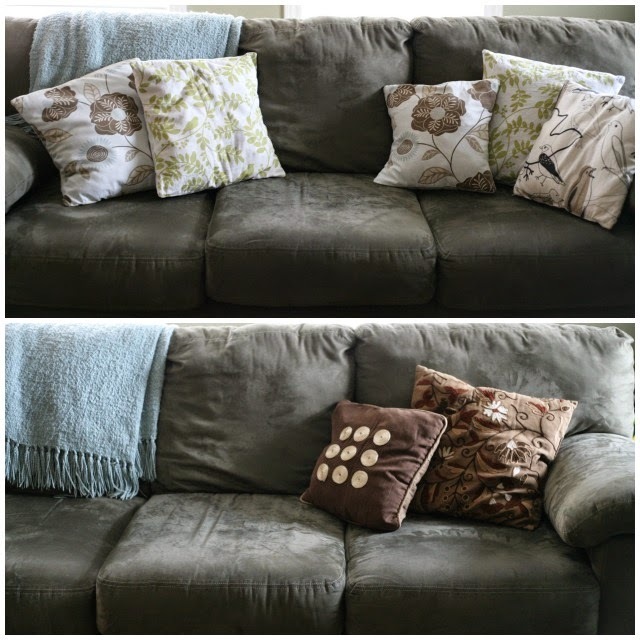 Pillows + I have pillows on my couch that are soft, comfy, and easy to manipulate. They are also brown and burgundy. They don't brighten our space or help reflect the light, so they make the room feel a little droopy. A couple of years ago I bought a few pillow covers off of Etsy to create a breezy feel. During the winter months, we can sport the brown and burgundy. During the spring/summer months, we bring out the greens, whites, and blues. It's an easy switch and I don't have to store entire pillows, just a few pillow covers that store away nice and flat. Lemons & Limes + Every hobby store has packages of faux lemons and limes. They cost mere dollars and can really bring some natural color to a room. About this time of the year, I swap out my pine cones and sticks for lemons and limes. Plants + Bring in the outdoors! I stick to the fake variety, but if you have a green thumb, grab yourself a few real plants. If not, just go to Ikea and spend a few bucks on some fake ones. Put those little cuties in a white pot and call it a day- a spring day! Candles + Nothing speaks fall and Christmas time like a nice, spicy candle. The same goes for spring and summer. Light up a fresh, floral, or clean smelling candle. I love Clean Cotton from Yankee Candle Co. and I also love honeysuckle candles. If that isn't your jam, look for lemon, lavender, or rose scented candles. Some of these things are very cheap, if not free, and can make all the difference in these last few weeks of winter. Try a couple of them and see if that wards off the winter blues.